We are pleased to highlight exhibitions of the work of OPF members and also artists we will be featuring in interviews. Exhibitions are listed by order of publication here, latest on top. "Kanzuru" is the first solo exhibition for artist Phil Holland. The show consists of images taken during his photographic adventures during 2006. Holland is known for producing a unique mood and a slight twist on reality within the frame. His landscape photographs have an unearthly feeling about them that draw you deep inside their wonderous scenery. 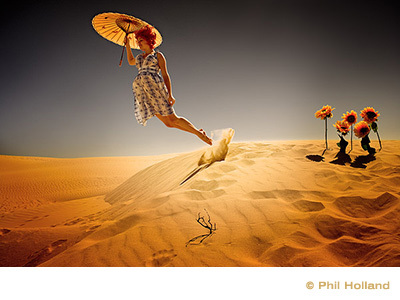 Phil Hollands' portraiture focuses on his subjects in rather surreal moments that capture your imagination. Every photograph in the show tells a different story and allows your mind to dive into each individual world. Opening reception Saturday, February 10th 2007 - 7pm - 10pm. 6. New York City - Jill Greenberg: "Monkey Portraits"
ClampArt is pleased to announce "Monkey Portraits" by Jill Greenberg, the artist's first solo show in New York City. The exhibition coincides with the release of the Greenberg's wonderful monograph of the same title from Bulfinch Press. Jill Greenberg first established her artistic reputation as a preeminent celebrity photographer, shooting such Hollywood personalities as David Bowie, Liza Minelli, Drew Barrymore, Clint Eastwood, Tom Cruise, and many more. Her images have appeared in numerous prestigious periodicals including "Time," "Wired," "Entertainment Weekly," and "Rolling Stone." In 2001, Greenberg turned her lens on celebrities of a different sort--namely monkeys and apes, many of whom have appeared in film and television roles. These brilliant portraits convey the startling range of emotions and personalities in our closest biological cousins with whom we share about 98 percent of our DNA. Referring to Jacques Lacan's psychoanalytic theory, artist and critic Paul Myoda writes: "[Greenberg] mischievously shows us another type of mirror stage, where we confront an ancient and distorted reflection, another startling spectacle, and try to make sense of who, or what we are seeing. By intentionally anthropomorphizing--or giving human qualities to--her monkeys, we can't help but identify with their gaze, and be reminded of people we know, expressions that we have seen before. Are they judging us? Laughing at us? Showing us that a couple extra chromosomes just doesn't make that much of a difference when all is said and done?" Printed on a massive scale, Greenberg's monkeys insistently demand our undivided attention; yet the gorgeous prints also seduce us in a subtler (and perhaps more powerful) manner with their sensuous, painterly textures achieved by the artist's expert digital finishing. For more information and images, please contact Brian Paul Clamp, Director, or see www.clampart.com. Gallery hours hours: Tuesday - Saturday, 11:00 a.m. - 6:00 p.m.
5. New York City - Nancy Burson: "The Hand of God"
ClampArt is very pleased to announce Nancy Burson: "The Hand of God"-- the inaugural show in the gallery's new, larger, ground floor space at 521-531 West 25th Street. This is the artist's first formal exhibition since her nomination in 2002 for "Best Solo Museum Show" by the American Art Critics Association for her retrospective, "Seeing and Believing," and her first exhibition in a commercial space in nearly a decade. Burson has devoted the past several years to public art projects with such organizations as Creative Time, the Lower Manhattan Cultural Council, and Deutsche Bank. Burson is best known for pioneering new technology in digital photography that has allowed her to create composite portraits which challenge notions of visual perception and identity. The software that Burson developed with scientists at the Massachusetts Institute of Technology in the late 1970s also has had practical applications, eventually enabling law enforcement officials to locate missing children and adults, for example. More recently, Burson has received significant press for her Human Race Machine, which allows viewers to see themselves as a different ethnicity. Her newest work revisits the discourse of visual credulity--specifically focusing on what Burson refers to as "God Consciousness." Through her artwork, she is attempting to materialize presumed intangibles such as spiritual phenomena and the supernatural while realigning the audience's expectations of the objective camera. In her celebrated series first exhibited in 2002, "Guys Who Look Like Jesus," Burson presents a grouping of ethnically diverse models who bear a resemblance to the icon. In this series, as well as in the companion piece, "Women Who Look Like Mary," the artist completes the portfolio with a composite portrait of all the likenesses. Burson takes viewers' expectation of the appearance of the religious icon and juxtaposes it with the images of her photographic subjects, addressing issues of race. In other photographs Burson depicts such spiritual phenomena as healing agents and energy fields. In one suite of large-format Polaroid prints collectively titled "The Vibhuti Series" (pictured above) the artist photographed sacred healing ash which is known to fall from the hands of Indian avatars such as the infamous Sathya Sai Baba. For a photograph titled "Archangel Michael," Burson once again collaborated with members of the scientific community to use new technology that pushes the limits of visual perception. With a gas discharge visualization camera she captured the energy fields surrounding a small, plastic figurine of the saint. And in another group of artworks, with a variety of more typical digital cameras, the artist explored the documentation of "orbs," described by geophysical researcher, John Burke, as: ". . .a form of plasma energy similar to lightning--in a sense, electrified air." Photographed in locations around the world, a bulk of Burson's "orb" images were shot in crop circles in England over several years. The opening of the show additionally marks the debut of Burson's second book of writing titled "Lineage." It is the artist's fascinating account of the miraculous phenomena appearing in her New York home during the past year which has been witnessed by members of both the arts and spiritual communities. ©Nancy Burson, "Untitled (Vibhuti)," 2005, Unique Polaroid print, 24 x 20 inches. Opening reception: Thursday, September 7, 2006 - 6:00 to 8:00 p.m.
4. Santa Fe - Tony Bonanno - "Hooves & Dust"
"Hooves & Dust" is a recent body of work by photographer Tony Bonanno depicting the raw power and energy of horses and riders on a western ranch. Light, motion, and energy are the main elements of this work. The work was featured in Horses In Art magazine in the Spring, 2006 issue. Opening Reception: 07/28/06 5-7:30 p.m.
3. New York - Marc Yankus - "Time and Again"
Marc Yankus is an increasingly popular modern photography artist. His work celebrates the present with stories and textures of the past. It appears that he is saying we can't escape time or accountability. I will be visiting the exhibition in N.Y. next week and will report back on my impressions and hopefully an interview with the artist. 2. Groningen - Jan Luursema - Music in the landscape"
Jan Luursema a photographer for the student newspaper in Groningen Holland. From 1-17 August the Usva will only be open in the afternoon, 12 AM to 5 PM. From August 18 to 23 it will also be open from 9 AM to 11 PM. Drop by if you're in the neighbourhood ;) Jan says he'll be happy to show you around! Contact Jan: website, email: jan_at_janluursema.nl (replace "_at_" by "@"). 1. Bordeaux - Nicolas Claris - "Large format"
Nicolas' work consists of editorial and advertising photography targeted for the yachting industry. This exhibition has the purpose to show, beyond Nicolas' approach, the possibilities of large format printing (up to 3 meter/10 ft!) with digital files shot with a DSLR. You'll see images printed by DUPON on photographic paper and transparency (Duratrans) with Lambda "printer", and on Fine Art Paper with an Epson 9600 printer.